R is the ideal, or universal, gas constant, equal to the product of the Boltzmann constant and the Avogadro constant. The power of the ideal gas law is in its simplicity. When any two of the thermodynamic variables, p, v, and T are given, the third can easily be found. The pressure, volume, and temperature of an ideal gas obey the ideal gas law. 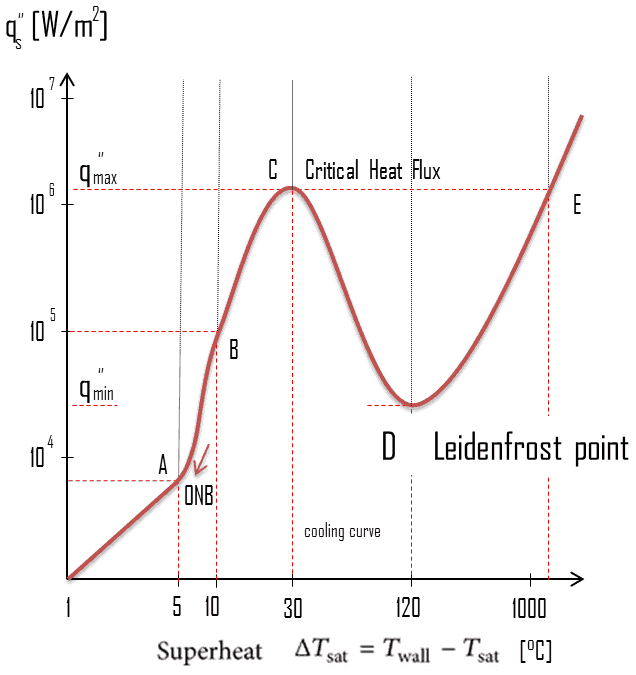 The specific heats — cp and cv — are independent of temperature which means that they are constants. The molecules of the gas are small, hard spheres. The only forces between the gas molecules are those that determine the point-like collisions. All collisions are elastic and all motion is frictionless. The average distance between molecules is much larger than the size of the molecules. The molecules are moving in random directions. There are no other attractive or repulsive force between these molecules. 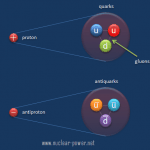 An ideal gas is defined as one in which all collisions between atoms or molecules are perfectly elastic and in which there are no intermolecular attractive forces. An ideal gas can be visualized as a collection of perfectly hard spheres which collide but which otherwise do not interact with each other. In reality, no real gases are like an ideal gas and therefore no real gases follow the ideal gas law or equation completely. At temperatures near a gases boiling point, increases in pressure will cause condensation to take place and drastic decreases in volume. At very high pressures, the intermolecular forces of a gas are significant. However, most gases are in approximate agreement at pressures and temperatures above their boiling point. The ideal gas law is utilized by engineers working with gases because it is simple to use and approximates real gas behavior. The internal energy of a fixed mass of an ideal gas depends only on its temperature (not pressure or volume). The specific enthalpy of a gas described by pV = nRT also depends on temperature only. Note that, the enthalpy is the thermodynamic quantity equivalent to the total heat content of a system. 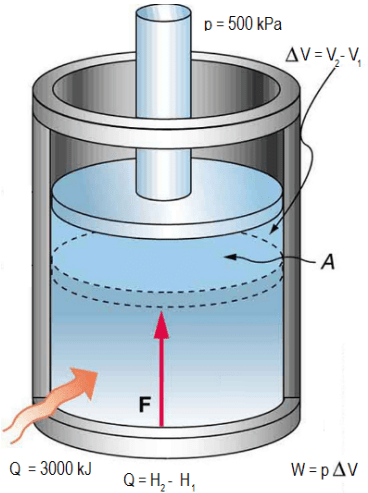 It is equal to the internal energy of the system plus the product of pressure and volume. In intensive variables the Joule’s second law is therefore given by h = h(T) = u(T) + pv = u(T) + RT. Any equation that relates the pressure, temperature, and specific volume of a substance is called an equation of state. The simplest and best-known equation of state for substances in the gas phase is the Ideal Gas equation of state. It was first stated by Émile Clapeyron in 1834 as a combination of the empirical Boyle’s law, Charles’ law and Avogadro’s Law. This equation predicts the p-v-T behavior of a gas quite accurately for dilute or low-pressure gases. In an ideal gas, molecules have no volume and do not interact. According to the ideal gas law, pressure varies linearly with temperature and quantity, and inversely with volume. The power of the ideal gas law is in its simplicity. When any two of the thermodynamic variables, p, v, and T are given, the third can easily be found. 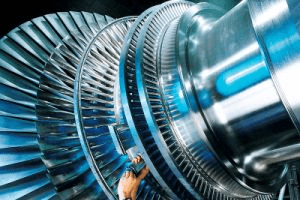 Many physical conditions of gases calculated by engineers fit the above description. 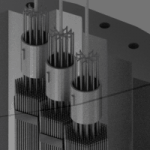 Perhaps the most common use of gas behavior studied by engineers is that of the compression process and expansion process using ideal gas approximations. A pressurizer is a key component of PWRs. 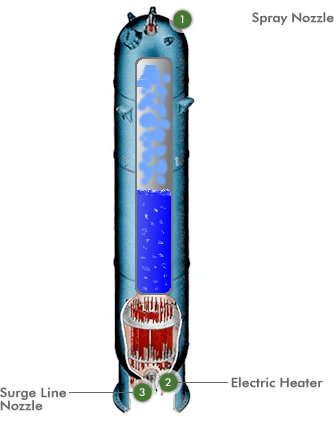 Pressure in the primary circuit of PWRs is maintained by a pressurizer, a separate vessel that is connected to the primary circuit (hot leg) and partially filled with water which is heated to the saturation temperature (boiling point) for the desired pressure by submerged electrical heaters. During the plant heatup the pressurizer can be filled by nitrogen instead of saturated steam. Assume that a pressurizer contains 12 m3 of nitrogen at 20°C and 15 bar. The temperature is raised to 35°C, and the volume is reduced to 8.5 m3. What is the final pressure of the gas inside the pressurizer? Assume that the gas is ideal. Note that we cannot convert units of volume and pressure to basic SI units, because they cancel out each other. On the other hand we have to use Kelvins instead of degrees of Celsius. Therefore Tinit = 293 K and Tfinal = 308 K.
Since ideal gas is defined as one in which all collisions between atoms or molecules are perfectly elastic and in which there are no intermolecular attractive forces, there is no such thing in nature as a truly ideal gas. On the other hand, all real gases approach the ideal state at low pressures (densities). At low pressures molecules are far enough apart that they do not interact with one another. 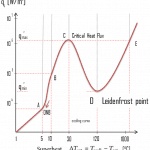 In other words, the Ideal Gas Law is accurate only at relatively low pressures (relative to the critical pressure pcr) and high temperatures (relative to the critical temperature Tcr). At these parameters, the compressibility factor, Z = pv / RT, is approximately 1. The compressibility factor is used to account for deviation from the ideal situation. This correction factor is dependent on pressure and temperature for each gas considered. The internal energy is the total of all the energy associated with the motion of the atoms or molecules in the system. Microscopic forms of energy include those due to the rotation, vibration, translation, and interactions among the molecules of a substance. where n is the number of moles. Each direction (x, y, and z) contributes (1/2)nRT to the internal energy. This is where the equipartition of energy idea comes in – any other contribution to the energy must also contribute (1/2)nRT. As can be seen, the internal energy of an ideal gas depends only on temperature and the number of moles of gas. This is only an approximation and applies at intermediate temperatures. At low temperatures only the translational kinetic energy contributes, and at higher temperatures two additional contributions (kinetic and potential energy) come from vibration. The internal energy will be greater at a given temperature than for a monatomic gas, but it will still be a function only of temperature for an ideal gas. 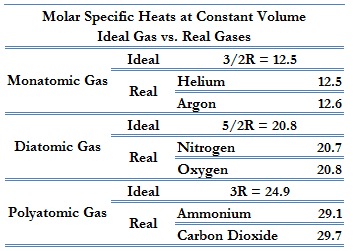 The internal energy of real gases also depends mainly on temperature, but similarly as the Ideal Gas Law, the internal energy of real gases depends also somewhat on pressure and volume. All real gases approach the ideal state at low pressures (densities). At low pressures molecules are far enough apart that they do not interact with one another. The internal energy of liquids and solids is quite complicated, for it includes electrical potential energy associated with the forces (or chemical bonds) between atoms and molecules. where the subscripts v and p denote the variables held fixed during differentiation. 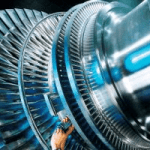 The properties cv and cp are referred to as specific heats (or heat capacities) because under certain special conditions they relate the temperature change of a system to the amount of energy added by heat transfer. 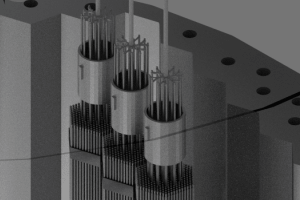 Their SI units are J/kg K or J/mol K. Two specific heats are defined for gases, one for constant volume (cv) and one for constant pressure (cp). This Cp is greater than the molar specific heat at constant volume Cv, because energy must now be supplied not only to raise the temperature of the gas but also for the gas to do work because in this case volume changes.